I love to take snapshots at nurseries but didn't have painting opportunities at any until last Saturday. Bellefontaine Nursery in Pasadena was on the list of our paint-out locations and I was looking forward to it. We almost didn't get permission to paint there but happily we were finally OKed. The nursery is owned by a Japanese family and has been open since 1939. The main building is an old, wood frame style that you just don't see here much any more. Wonderful that it's still standing for us to enjoy. The nursery has so many alcoves of plant varieties, lath structures, and pots that I spent too long walking around investigating and had to quickly chose a view to start painting. I've always loved the look of lath houses. Lots of interesting shapes and all those patterns of light and shadow catch my eye. 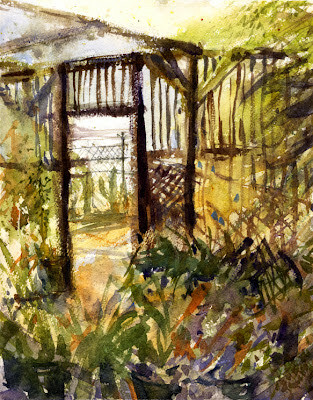 I chose a spot to paint with a view into one of the lath houses that was roped off. My painting (approx. 8"x10") and view, and also a photo of the modest set-up I'm using right now. 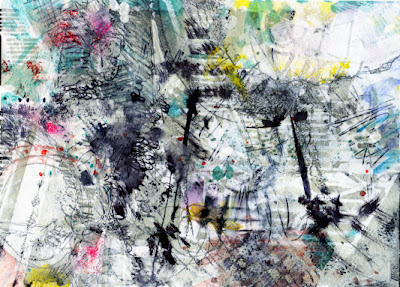 I hand-hold a watercolor block. I was waiting for my first wash to dry when I took this shot. There's also a photo below of a little friend I saw while investigating. 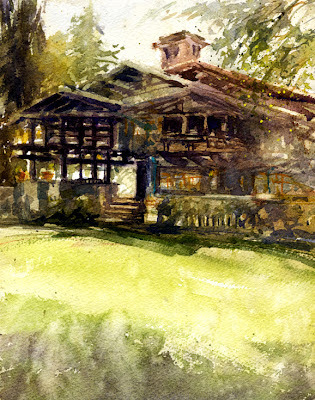 On Thursday we met at the Gamble House in Pasadena for our plein air paint-out. The Gamble House is magnificent and is a National Historic Landmark. The house and its furnishings were designed by Charles and Henry Greene, and it's considered to be America's Arts and Crafts masterpiece. It was built in 1908 as a home for David and Mary Gamble of the Proctor & Gamble Co. Fortunately it is open for public tours! It was a bright day and not too hot yet. Looking at the house as a subject to paint, well, it is complicated. The house shows Asian aesthetic influences with its use of natural materials and design. There are exterior porches with gorgeous beams which echo Japanese cloud shapes. Lots of light and shadows are created by many rafters and eaves. I had to try to simplify. I found some shade under a tree across the lawn at the rear. The stained wood exterior makes a very neutral-toned subject all shaded by dramatic roof lines. A difficult but relaxing challenge. Here is my painting and some photos of the house, as well as the artists. We have had such a hot summer here in Southern California and I know that's been the case all over the country. It's been one long heat wave. So far 2012 is the hottest on record in the US. Here it is September 22, the first day of Fall, the autumnal eqinox. I'm ready for some cooler weather which we will hopefully see. 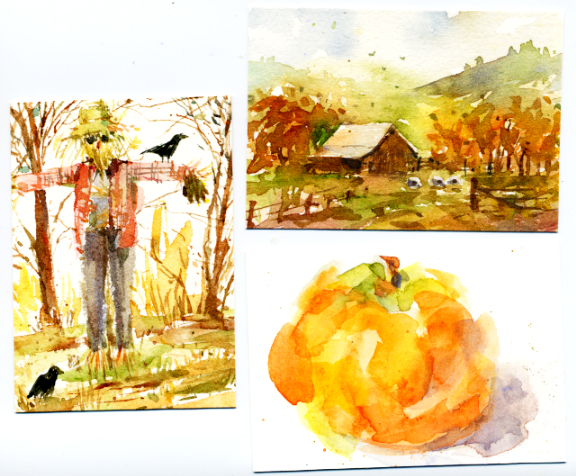 I was thinking about some autumn inspired watercolors I painted last fall. 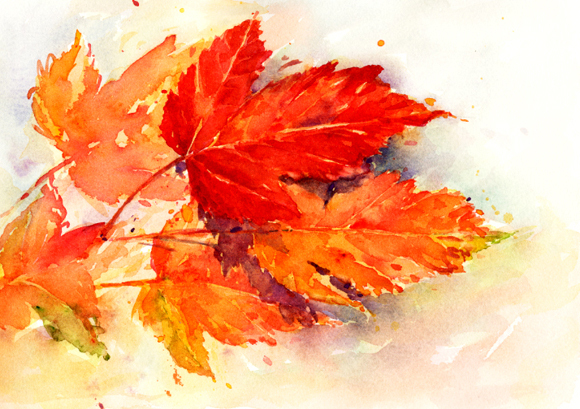 The first is some autumn leaves that have turned colors, painted for a group on the Paint My Photo website. Most people painted the same photo and it was fun to see everyone's version. 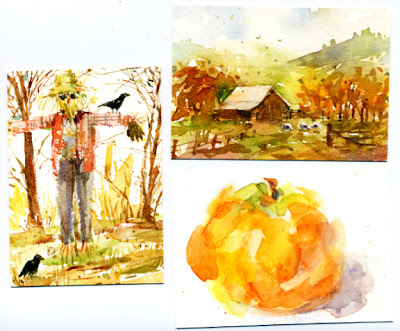 I was feeling in a fall mood when I painted these three ACEOs. I had a persimmon as a model for that piece. The other two are just made up. I really enjoyed adding the crows to the scarecrow piece. 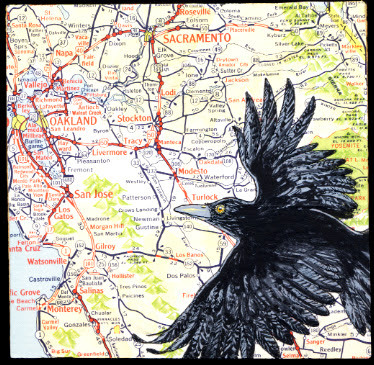 ACEOs are always 2 1/2" x 3 1/2", but can be any media. Sometimes they're called ATCs, Artist Trading Cards. This last piece was for a monthly challenge in a Facebook group. 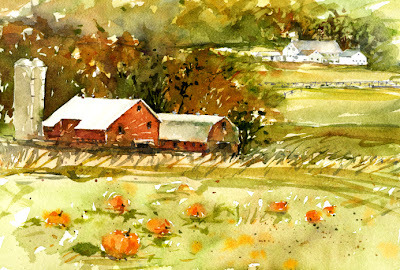 One member (Terry Freemark) posted some of her photos of Pennsylvania farms to use to paint from, or for inspiration. I combined two photos for my watercolor. 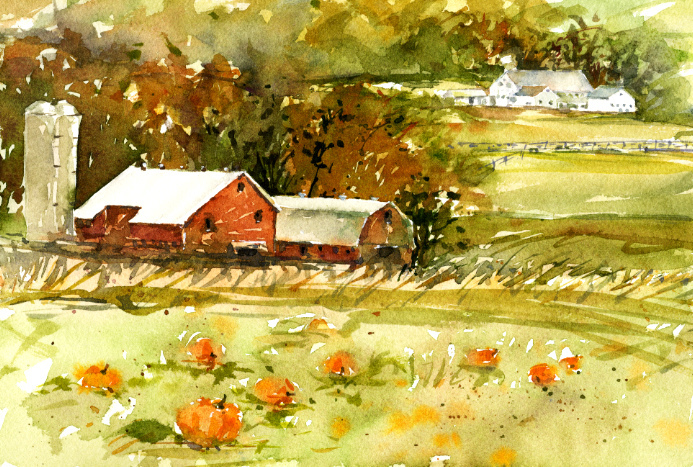 A pumpkin farm! I'm already inspired for this year. Hopefully these fall thoughts will bring some cool weather. 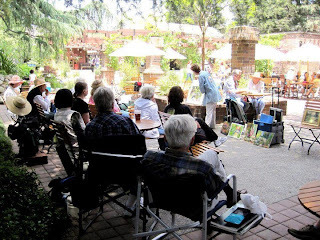 What a lovely afternoon I had last Saturday with my plein air painting friends. 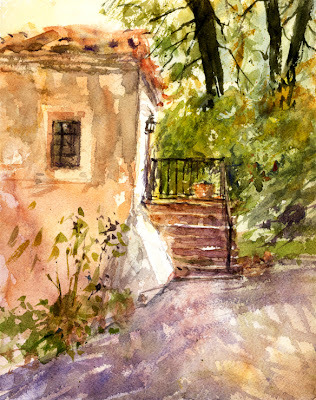 We met at the Old Mill, El Molino Viejo, in San Marino. This wonderful old adobe building, from 1816, was the grist mill for the San Gabriel Mission. I've painted at the Mission twice, featured in my post "Painting in San Gabriel". The California Art Club maintains a permanent gallery at the mill and we painters were interested in seeing the current show as well as painting. The weather was very hot here again but there was plenty of shade to find on the beautiful grounds surrounding the mill. In the few months I've been doing plein air painting, this was my second visit to the Old Mill. There are a lot of interesting views and gardens to find for subject matter. I'll post my watercolor from my previous visit and my piece from this week. Plus, a few added tidbits I like to share. In March I painted the main entrance, 9"x12" including narrow borders. Last Saturday I chose a back entrance and courtyard, 8"x10". Some friends painting the same view I was painting. One of the main features of the garden area is the Pomegranate Patio. The trees have lots of fruit that's just not ripe enough yet. I'll be back next month and looking forward to seeing some beautiful red pomegranates. 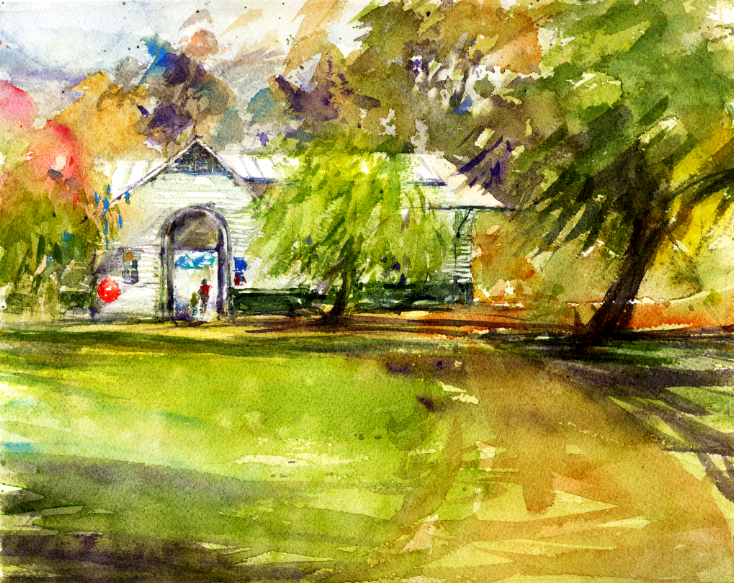 The Thursday Plein Air group met at Brookside Park last week. It's part of the Rose Bowl recreation area in Pasadena. There is an Aquatic Center, golf course, baseball diamonds, soccer field, views of the mountains, just to mention part of this busy location. There is also a long wisteria covered walk which I wanted to check out to possibly try painting. Too late for wisteria so I kept walking. The day was going to be very hot as our summer has been, so shade was a requirement. I decided to paint the Kidspace Children's Museum from under a huge old tree. It's in a lovely old building which seems to be repurposed vintage horse barns. It's set among lots of trees and not even noticeable from the parking area but we were at the museum in June with our grandkids so the building was on my mind. I'm posting my painting here, approx. 8"x10", and a photo of my view. Brookside Park was so pretty in the light and shadow that morning, I'm adding a photo of my view looking in the opposite direction which would also be nice to paint. And, one more of the mirrored Kaleidoscope Tunnel which you pass through as you enter Kidspace. In this shot you can see my painting spot under the tree! It was wonderful to see a few friends to paint with last Saturday. I missed our previous plein air outing so it felt like it had been awhile since I saw them. 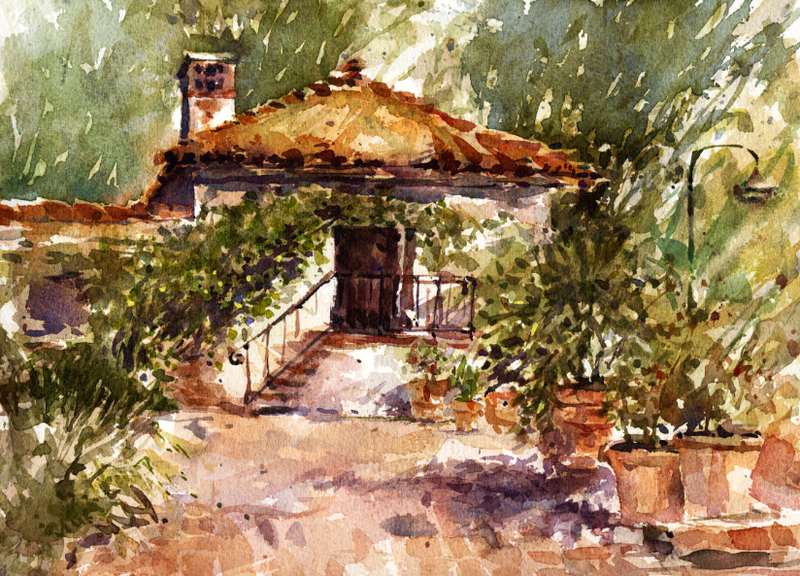 The weather this summer has been unusually hot and I was looking forward to painting at beautiful Lacy Park in San Marino where we were meeting. We actually ended up meeting outside the West entrance. There is an extensive rose arbor on that side of the park. It's an enjoyable view to paint, and trees for shade, without paying the weekend entrance fee for non-residents. We'll do that next time! 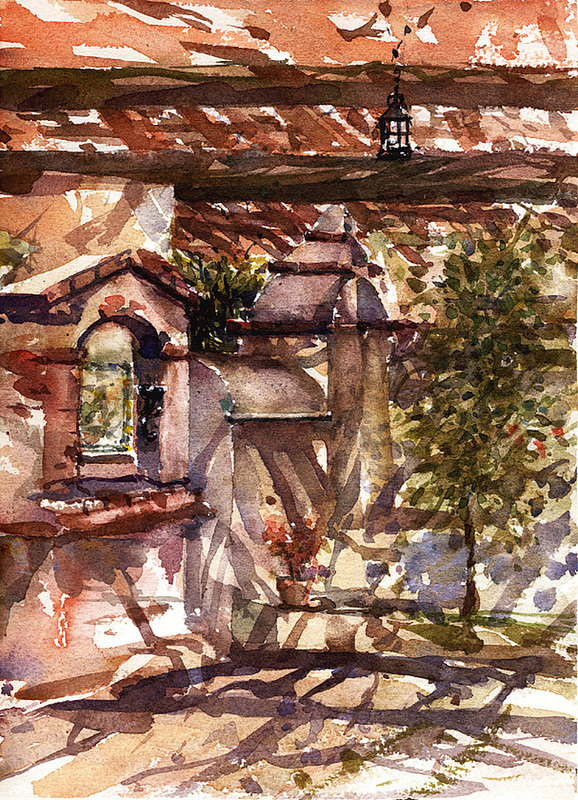 Here is my watercolor and photo of my approximate view. It's 8"x10". While noticing I had a few paintings for my last post, "Chinese Themes", I also noticed a few with Japanese themes. Two of these are subjects from Descanso Gardens in La Canada Flintridge, CA. It's a gorgeous public garden, or rather a collection of gardens. 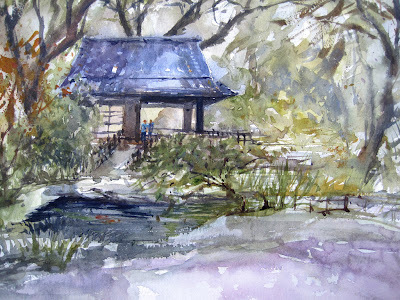 There is a Camellia Collection, Japanese Garden and tea house, Rose Garden, as well as woodlands, fountains and ponds. Lots of squirrels, ducks, turtles, frogs, and I saw a family of Canada Geese on my last visit...photo below. The first small painting of a Japanese stone lantern was done for the online watercolor class instructed by Vinita Pappas in 2011. The lesson was about mixing neutral colors and I thought the gray stone would be good to try. I always take a photo of this lantern sitting in the dappled shade in a big patch of mondo grass. This piece was also painted for Vinita's online class. She put together a video for Earth Day of paintings that we submitted. 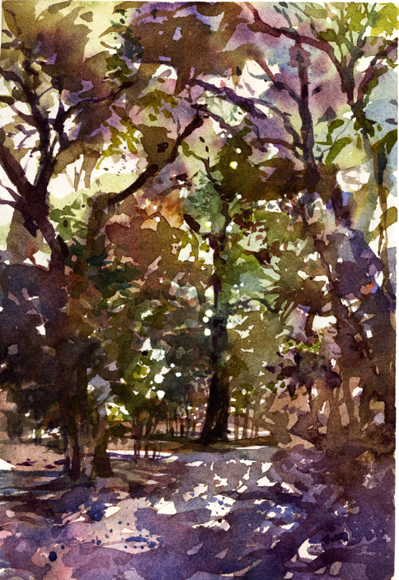 I painted my piece from a photo I took while walking through the shaded woodland area. I always like greens and purples together it seems. The next painting was done when the plein air group went to Descanso in May. This is the tea house. There is a relaxing koi pond surrounded by Japanese maples and huge oaks. It was very peaceful painting on a Thursday morning until bus-loads of pre-schoolers arrived. I had fun answering their questions which were pretty cute. I always like to take a photo of our big friendly plein air group. This view shows most of the painters that day. Brenda Swenson is talking about the watercolors. It's the Canada Goose family crossing a bridge over one of the steams! I heard about them from people all morning and was so happy to see them coming my way. Painters, tourists, birders, and pre-schoolers didn't seem to bother them at all. I noticed a Flickr member clicked to "favorite" a couple of my watercolors. They were both sort of Chinese themed paintings. I must say these are a favorite of mine to paint. There are many exotic and beautiful subjects of course. I'll share three paintings here. 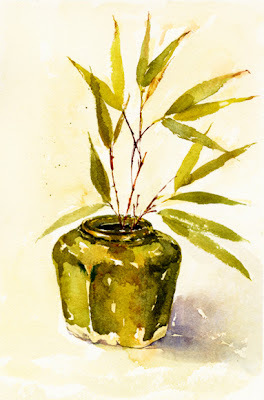 The first is of some bamboo in an old green glazed Chinese pottery ginger jar. This was a still life I put together for the second lesson in an online watercolor class which Vinita Pappas taught in 2011. I really enjoyed painting this piece. The brush manipulation for the bamboo was fun to try. This piece was painted for Vinita's 7 Days in May project for the class. 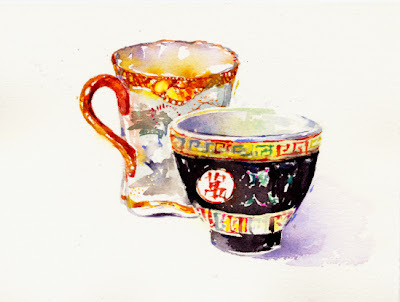 I chose a Chinese teacup and a Japanese teacup for my still life. Another fun painting. It's small, 6" x 8". This last watercolor was painted for a monthly challenge in a Facebook group. The challenge was to use neutral colors with some reds. 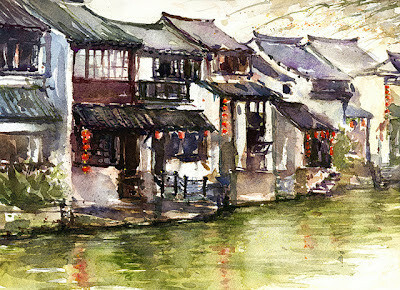 I chose a photo from the Paint My Photo website of an ancient "water village" near Shanghai, China. I would love to see one of these villages in person. 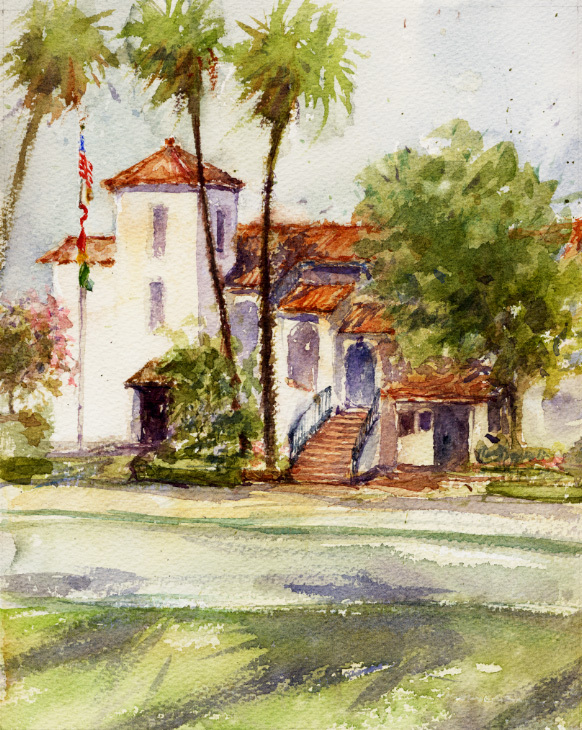 The location for Thursday's plein air paintout was the San Gabriel Mission (Mission San Gabriel Arcangel, 1771). The last time the group painted at the Mission was in March, my second outing with them. 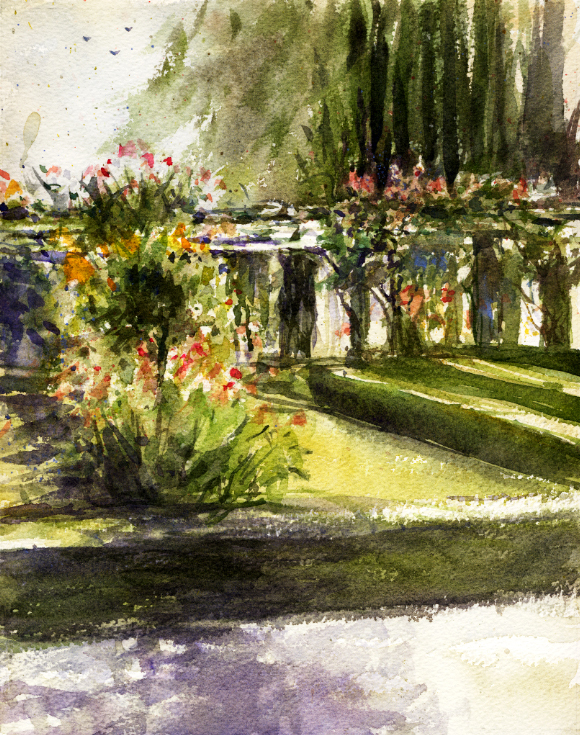 That day most of us went inside the walled garden/courtyard to paint. Since I had little experience with plein air painting I chose a view of the grape arbor to paint that I wouldn't chose now. The day started off dreary but when the sun came out the area became a confusing mess of shadows. I'll post my painting and the view I chose to try. Thursday's painting is below. On Thursday the artists stayed outside the Mission and looked around the area for subjects. There are many nice views to paint there. 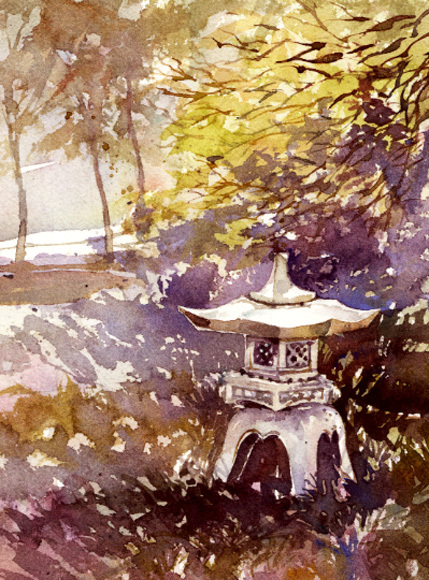 I was looking for something that appealed and where I could paint in some shade. I chose the San Gabriel City Hall. It's in an old 1923 Spanish style building. Here is my painting and my photo of the view. I'm also adding my photo of the Mission from the lawn/park where I painted facing another direction. There are a few of my painting friends trying the Mission view. I might try it next time. 350.org is a widespread climate campaign. On October 24, 2009 over 2,000 events took place in over 150 countries, one of them at Zinnia in South Pasadena. Zinnia's goal was to hang 350 pieces of art, each being 350 picas square (about 5"). They gave out the wood squares to artists to do with what they pleased for the show. The anonymous artworks were all hung in Zinnia's gallery behind curtains and unveiled on October 24 at 3:50 PM. Each piece was priced at 350 pesos ($26.22), 350 cents going to 350.org. With so many artists participating, the project generated a lot of excitement and most pieces sold. What a fun event! 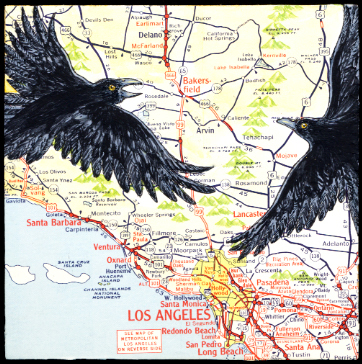 Here are my two pieces which I painted on actual paper map sections. One is of the Los Angeles area and the other near San Francisco. I'm also adding a couple photos showing only part of the 350 artworks at the show. There was something for every taste! The Virtual Paintout - Tasmania! Artwork from all the previous Virtual Paintouts are still available to check out. Bill also posts the submissions on Facebook. Bill must have fun selecting the month's location from worldwide options the Google Street View vehicles have covered with their cameras. The first city I "walked" around was Boston and I was overwhelmed. I couldn't find anything I wanted to paint but maybe that was because I hadn't done any actual plein air painting in years. The August 2012 location was Tasmania! There is a place I will never be able to look around in person. This time I found several views and had fun looking around the island. 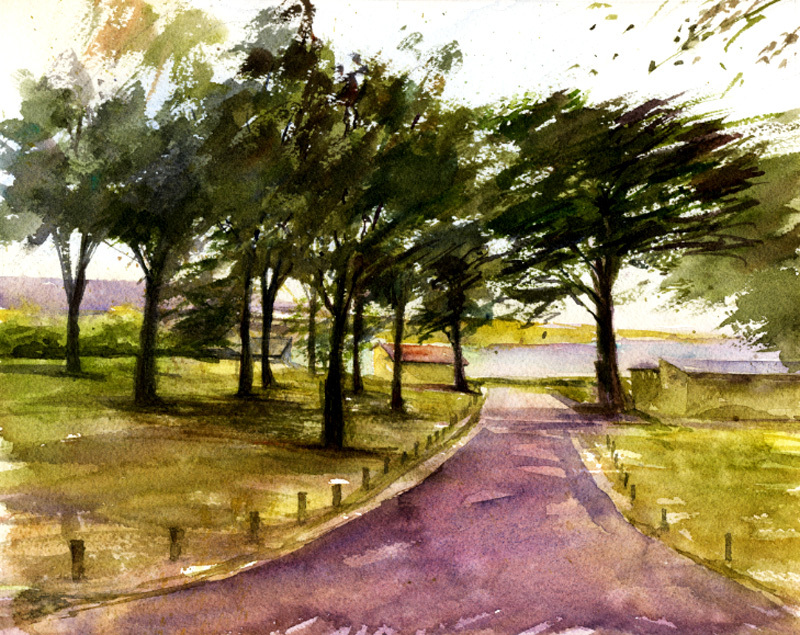 Here is my watercolor of a beach road in Tasmania. Below is an abstract piece I also painted this month for a fun monthly challenge for a Facebook group I'm in. The theme for August was "Abstract". While looking around the map of Tasmania, I had maps on my mind while I painted this.